I tend to associate coffee stouts with being big, heavy beers. I also tend to associate Dogfish Head beers with the same adjectives. So a fairly tame coffee stout from this brewery definitely is "off centered" in plenty of ways. While it doesn’t have to in-your-face robustness of an imperial, it still has the great taste, balance, and drinkability of a high quality beer. I poured a 12oz bottle into a Dogfish Head goblet. It cost $3.80 ($0.32 per ounce). Appearance: Opaque black hue all around. Forms a big, frothy, coffee-colored heard which retains very well and leaves some lacing. Smell: Strong coffee aroma but with a distinct herbal or earthy sweetness (not sugary). Taste: If you enjoy the subtle nuances of a well-crafted beer, then Dogfish Head Chicory Stout definitely is for you. 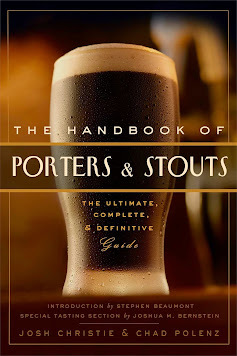 It has the classic stout flavor at the core, but the edges are rounded out with fine details. Coffee is a strong flavor throughout the palate and was the first thing I tasted. It’s not sweet sugary iced coffee, nor is it intense, deeply roasted coffee. The taste is that perfect middle ground that’s balanced out with something other than sugar and cream. According to the description the beer is brewed with licorice root, which would account for that taste. I detect bitterness through the middle with hints of citrus, though it’s a short-lived flavor. The coffee flavor resurges at the end along with a dry, spicy chicory flavor. It’s similar to nutmeg or cinnamon, but more refined. All these flavors add up to a delectable, delightful palate and make this a good dessert brew without the chutzpah of something imperial. Drinkability: What makes this beer even more enjoyable is how amazingly drinkable it is. The texture is creamy and soft which accounts for the almost ridiculously smooth finish. The aftertaste is somewhat dry, but clean and tolerable with no cloying presence at all. The fact Dogfish Head Chicory Stout is only 5.2% ABV is nothing short of amazing, as you don’t tend to get so much flavor out of something this "light."